This is a 1 hour and 56 minutes cut with the action more in front. Also some music overdub. To create a faster story and trying to get the action more on top. Opening scene is trimmed, Castro is cut. The beach scene is cut, buying a Porsche is cut. The music clip Push it to the limit is cut. The beginning in Bolivia is trimmed. I cut some scenes of the Babylon club. There is a lot of slight cuts to pull up the story, like dialogue between Manny and Gina and the Mother of Montana. The Bathtub scene is cut. Restaurant and New York scene is trimmed. There are some lines cut in the end shooting. Scarface works surprisingly well as a two hour movie, the dialogue trims here and there are seamless and the streamlining of the narrative is well thought out and considered. Like the other reviewer I would probably agree the Elvira character is less important than Tony's sister to the overall narrative once the second half of the movie begins. Elvira could easily be jettisoned altogether after her first couple of scenes in the original movie. The marriage scene/ push it to the limit montage is cut and she only appears in the restaurant scene subsequently in this cut but that scene does add to Tony's unravelling in the second half of the edit so I can understand its inclusion too. Pretty much perfect edit from a technical point of view, it doesn't deviate greatly from the original movie in any way but does what it says on the tin and offers a more streamlined 'to the point' version of this gangster classic. Well worth a look!! I absolutely loved this edit. It's very well edited and AV is perfect. 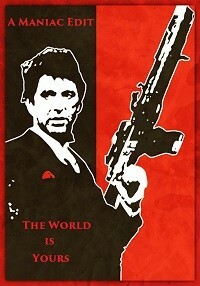 It's an almost perfect cut of Scarface. I think the editor could have gone further and cut the Elvira character altogether, but I understand his reason for keeping her in. Highly recommended for any fans of the genre. But I'm knocking off an Enjoyment point for removing the most iconic, badass line in the whole film.